Tonight, the boys and I are ghosthunting. 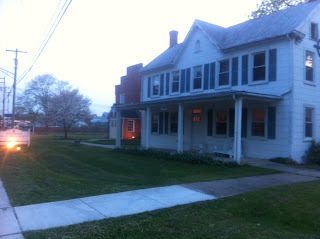 After a long and pleasant day, we've set up base camp in my office in the old manse. Initial readings on the first room...EVP, Gauss meter, and temperature...read normal. Some EVP anomalies in two locations, one corner, one in center of room. Still nice out, a gorgeous late spring evening. 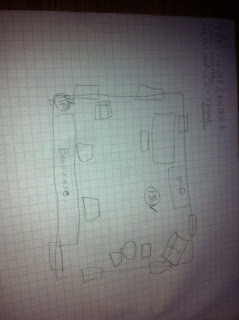 We're mapping the rest of the house now, laying out room charts to trace changes over time. Will update the blog hourly, or as we encounter anything interesting. Mapping of the house interrupted by arrival of local media...Rande from the Monocacy Monacle. A pleasant interruption. We talk through some of the history of the house...it's 1827 construction, the reportage that it was one of many homes pressed into service as mobile surgical hospitals following the Civil War Battle of Balls Bluff. We go into the old room above the abandoned kitchen, which he agrees is a tick creepy. Pictures are taken. I show him the old bookcase in my office, with the school bell and the handwritten records from the late 19th century. The Gauss meter freaks out for a while, spiking relentlessly like it's being bombarded by EMF radiation. Just put that battery in yesterday, but replacing it with one of our spares seems to resolve the problem. Hmmm. Back to our readings now. Finishing up baseline readings in the rooms. No significant anomalies, although the Gauss meter continues to squawk and howl at us grumpily on occasion. Rooms mapped by temperature, electromagnetic fields on graph paper, to track anything unusual. Closets in the upstairs youth room seemed to yield odd EMF readings...my meter clicked over faster every time I ran it over the picture of Jesus on the door. Go Jesus! Ahem. The sun is starting to set, and the house grows darker and cooler. I'm kicking the heat on in the office, which we'll take into account when we run our second round of measurements. We'll leave the rest of the house cool. Less interference with the equipment that way. I will confess to feeling slightly creeped out as I went back to put the room-map in the room above the kitchen. Just a bit of nerves, I'm sure. property. Two teen girls...likely the source of that laughter we heard earlier...are chilling in the gazebo. I return as darkness settles. Things are starting to cool down a great deal. The motion sensor is now armed and in place between the two classrooms. It's a tick hypersensitive, but I manage to slink away without setting it off. It's a lovely, lovely night. About another quarter of an hour, and we'll do another run through the house with the instruments. Reminder to self...turn off the flipping motion sensor before you enter the room where you have it set up. That scared the bejabbers out of us. Of course, if we'd turned on the lights instead of wandering through the house with flashlights, it might have been less startling. But it's better video ambiance, I tell myself. Readings are mostly normal, although there was a brief EVP pulse at the top of the stairs when we did our readings. Mostly nothing, I'm sure. Getting tired. Kids are tired. House is quiet. We've inflated the travel mattress, and the big guy takes a rest for a bit, as we all will in turns over the course of the night. The question is asked...have people lived in the manse in the recent past? The answer, of course, is no. But the building was used to house a family of Vietnamese refugees after the war, part of the church caring for those in need. "Vietnamese ghost people," I say, fuddling my words. Next cycle of instrumented testing will be at 10:00 PM. We do the walk through, and the guys are clearly tired. My brain isn't running optimally either. We natter our way through each room. It would be considerably less scary if I just turned the lights on, but I don't. You know, because the lights might mess with the instruments. Ahem. We return, having pitched out our readings. Few variable things this time out. A peculiar reading in a closet, but nothing intense. Normal stuff picked up by the thermometer and EMF sensor. Cold spots by windows? EMF intensity by electronics? Who'd a thunk it? It's surprisingly warm upstairs, we find. But this is no surprise. What is a bit surprising is that it is warmest in the room above the abandoned kitchen, which is the coldest room. Not quite sure why that is, given that there's no heat on in either. Residual heat, perhaps, but it's so late and there's not a lick of insulation to hold the heat in. The house is full of creaks and cracks, not surprising given it's considerable vintage. And the fact that it doesn't rest on a solid foundation, but a foundation made of cedar logs that rest on dirt. It shifts and settles, vaguely fluid. The heat comes on, and it clicks away. The boys try to sleep. The boys succeed in conking out. Very quiet now, with the exception of my older son's snoring, which briefly was like being stuck inside a large industrial percolator. But even that has faded. Now, it's just vaguely cozy. I wonder what this house would have been like on such a night, a bright spring night back in the 1840s. Eleven free souls, and four human beings who were property in the eyes of the law. It would have been a house full of the sounds of sleeping, of snoring and...yawn. Now, though, the house is simply quiet. Even the road outside is mostly silent now, as Poolesville grows still. The boys remain sound asleep, and during a goodnight conversation with my wife I am reminded that perhaps I have underestimated the difficulty I'll have waking them. Waking up a 15 year old and a 12 year old from deep sleep? Hmm. Maybe they'll get a better night's sleep than anticipated. Or maybe, if I were a very slightly different sort of dad, I'd wake them in a faux panic, setting off the howling motion detector and messing with the lights. But I never did enjoy pranks. And neither, I suspect, would they. I'll give them a few more minutes, and then we'll see whether they'll be rousable. I move to a couple of the spots where we got brief, flickering changes in the EVP meter. The top of the stairs, for instance. In the darkness, I do that "make a sign to show your presence" thing. I video, and I wait. It's spooky, sure, but otherwise there's just not much response. Time to get a bit of shut eye. Though the kids are down for the count, I get up for a brief walk-through, checking the rooms. House remains quiet. Motion detector remains quiet. We're all up now, after a bit of fitful rest. We do a full run through of the house, starting about half an hour ago, in the dead of night. The house is cold, as it gets in this old and drafty building. Temperatures are in the high fifties. We do our last set of full detailed readings for the evening. I ask a sequence of questions in each of the rooms we encountered EMF anomalies...in the hall, two classrooms, and the room above the kitchen. We ask if anyone is there, and ask that they find some way to show themselves. There's just silence. The sensors reveal nothing. Creeps us out, of course. But other than that, nothing. The day rises, and the manse is brightening up nicely. We walk to McDonalds, and nosh groggily. On the walk back, we discuss our opinion on the building. Creepy? Perhaps, although it's nothing some repair work and straightening won't fix. But haunted? There were no events, no responses. The sensors picked up nothing that wasn't explicable, and although the Gauss meter's freakout was a bit off putting, it was probably just a manufacturing defect. The consensus among the team is that it's not likely. This house is clean. Paranormally speaking, anyway.